The reality series has been a successful performer in the summer months so ABC has decided to try a winter edition as well. Here’s the information from the network. The Big Balls are shivering in anticipation because this January, ABC’s “Wipeout” is back with a brand new “Winter Wonderland” course, complete with slippery ice, frosty snow and numerous avalanches of Wipeouts. Cold climate-loving contestants will bundle up as they compete on all-new stunts such as the Spanker Sleds, the Wipeout Ski Lift and the Polar Bear Run. So cozy up by the fire with a cup of hot chocolate, and join us for a winter edition that is sure to “Wipeout” your winter blues. This new winter series will be in addition to the summer series of season four, bringing the season episode order to 24 episodes. “Wipeout” is hosted by John Anderson (ESPN’s “SportsCenter,”), John Henson (E! Entertainment’s “Talk Soup”) and co-hosted by Jill Wagner. 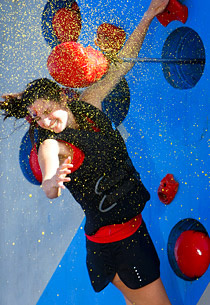 In Wipeout, 24 energetic, new contestants of all ages, shapes and sizes go head to head through four rounds of demanding but hilarious obstacle courses to win the title of “Wipeout Champion” and the $50,000 grand prize. In the end, only one contestant will be victorious, while everyone else will Wipeout! “Wipeout” executive producers are Matt Kunitz (“Fear Factor”) and Scott Larsen. Shye Sutherland, Kevin Wehrenberg, Trice Barto and J. Rupert Thompson are co-executive producers. The series is produced by Endemol USA. David Goldberg is the chairman of Endemol North America. Endemol USA is a leading producer of television programming specializing in reality and non-scripted genres for network and cable television. The company produces the break-out hits “Deal or No Deal,” “Wipeout,” “Extreme Makeover: Home Edition” and “Big Brother.” Endemol USA is a division of the Endemol Group, a prominent international content developer, producer and distributor of television and online programming. The company, headquartered in the Netherlands, has subsidiaries and joint ventures in 25 countries, including the major European markets, the U.S., South Africa, Argentina, Brazil, Mexico and Australia. Endemol is owned by a consortium consisting of Goldman Sachs Capital Partners, Mediaset Group and Cyrte Group. For more information, please visit http://www.endemolusa.tv. Endemol is a privately held company. What do you think? Do you think it’s a good idea to run this show in the winter months? More about: Wipeout, Wipeout: canceled or renewed?